Gourmet Dark Chocolate Brownies. Welcome to Simply Divine Brownies. TO SEE OUR SIMPLY DIVINE SPECIALS, click here. Welcome to Simply Divine Brownies, where you'll find a delectable array of gourmet brownies. Do you swoon for peanut butter? Then try our out-of-this-world peanut butter brownie. Go nuts for caramel? How about our scrumptious turtle brownie? With over 30 brownies to choose from, there is sure to be a perfect brownie match for everyone on your shopping list! And if you're aiming to please a crowd, we've got you covered! 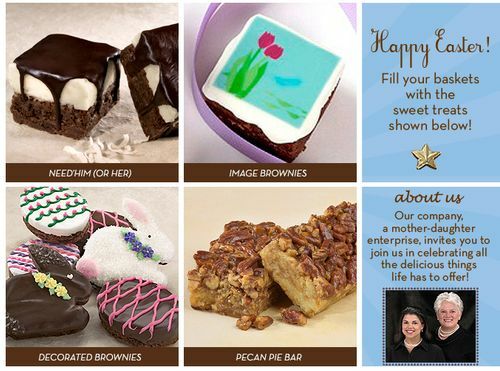 Simply Divine's gourmet brownies make great corporate gifts, holiday gifts and party favors. Any way you cut it, Simply Divine Brownies are a little slice of heaven. treat for you and yours!